by Christopher Beaubien • February 07, 2013 • Start the Discussion! 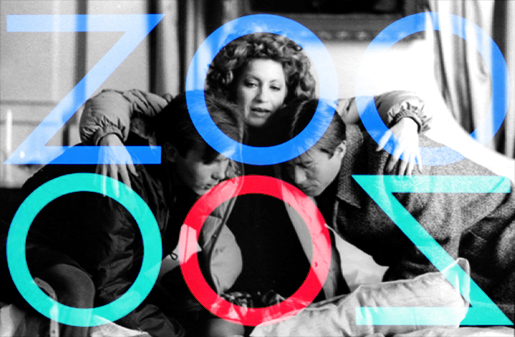 Peter Greenaway’s sumptuously decadent film A Zed and Two Noughts (1985) is one that sates both the visceral and cerebral palettes. One of the main themes that Greenaway presents is his “…fascination of twinship… particularly conjoined Siamese twins.”¹ Not only do the twin brothers progressively shed their individualistic fashion traits to look more alike, but Greenaway also conspires to make the composition of select shots throughout the film look synchronized. In this particular image of a lavish, heaven-like hospital room, the left side of the frame is practically mirrored with the right side. Production designers Ben van Os and Jan Roelfs place the furnishings to reflect one another across each other with a mathematical exactness. by Christopher Beaubien • May 13, 2011 • Start the Discussion! This is my best impression of a lamb. 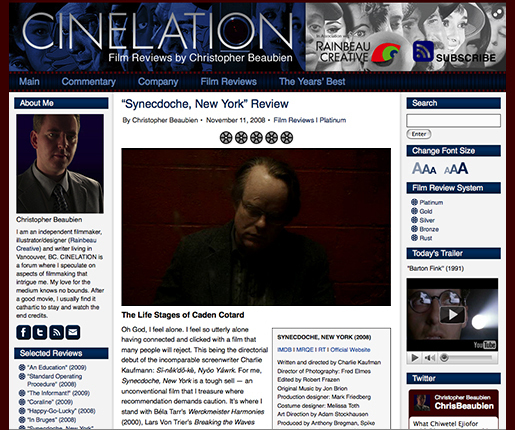 Last Saturday, Cinelation was submitted as the #922 website in the Large Association of Movie Blogs (LAMB). Special thanks to Rachel, one of the site’s leading authors, who took my website into consideration and posted it. The next day I was encouraged by Max Covill of Impassioned Cinema who found Cinelation through the LAMB. Judging from his output, the name for his website is very appropriate. Of the livestock available, thank goodness the LAMB’s mascot is an adorable, fluffy one instead of grotesquely characterized variant. by Christopher Beaubien • May 11, 2011 • Start the Discussion! It’s time to get to the bottom of this. Every time I play one of my DVDs for Krzysztof Kieslowski’s Decalogue (1988) series, I see the Facets Video logo: Six seconds that quickly fade in and out with fourteen movie clips a half-second each. Over the past seven years I have been able to identify four of them, which means I should be watching more films released by Facets prior to August 19, 2003. I thought about getting in contact with Facets and asking them what these titles are, but what fun would that be for you cinephiles out there? If you know which movies belong to any of these still images, write it in the comments and I’ll credit you along with the answer in this article. by Christopher Beaubien • April 27, 2010 • Start the Discussion! At last I am pleased with the look of the site. Being a bloody perfectionist is a torture for me. Nothing ever feels truly done. My head whispers incessantly, “It is never enough.” What’s worse about internal complaints are the echoes. With a blast of relief, I can look at Cinelation and not squint over a detail too inane for most to notice. Actually, I am more than pleased with the result. It really does look wonderful now. The joy of being a bloody perfectionist! In the Spring of 2008, I began writing for a modest movie blog with only promises of being paid for all my work – once it became profitable. One year later, those promises turned more transparent as fewer e-mails about compensation were returned. This was after I went up and beyond to get their website promoted on the Synecdoche, New York DVD without so much as two nickles to rub together. I am a genuinely faithful man, but my patience went from creaking to dilapidation. This couldn’t be avoided any further. I would have to build my own website to house my reviews. by Christopher Beaubien • November 07, 2009 • Start the Discussion! 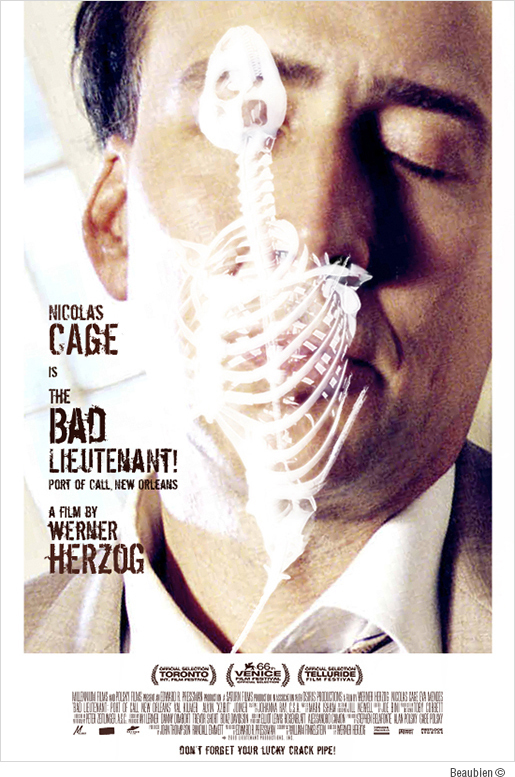 Two weeks ago, Chicago-based film reviewer codenamed Quint (real name: Jim Fyfe) from Ain’t It Cool News challenged graphic designers and film fanatics alike to participate in a contest: Make An Insane Movie Poster of Bad Lieutenant: Port of Call New Orleans. Quint being a great admirer of the new Werner Herzog film from this year’s Toronto International Film Festival (TIFF) – not to mention Jaws (1975)! – has had mixed feelings toward what its distributors First Look Studios and Polsky Films have done in the way of movie posters. First, they made an edgy poster that the MPAA threw its gavel down hard on for showing its title character pointing a gun at someone. 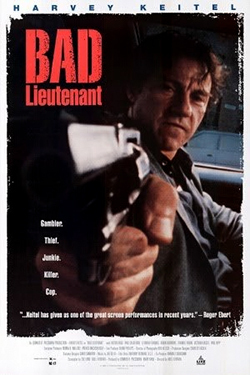 Harvey Keitel, the original 1992 Bad Lieutenant from the 1992 Abel Ferrara film, amongst thousands of other trigger-itchy characters can point their gun at us gazers, but according to the MPAA we can’t handle anyone inside the poster being promised some bullets. Finally, First Look settled on a poster that looks like your generic rogue cop-seeks-killer thriller complete with two famous giant heads suspended over a landscape of dread and action.